All of us have been placed on hold during a phone call at one time or another, but most of us don’t find that particularly fulfilling or fun. However, as the latest book in the Millionaire Real Estate Investor series outlines, buying and HOLDing real estate in order to build wealth can be fulfilling and even a little bit of fun, too. The subtitle for this book is “How to Find, Buy and Rent Houses for Wealth”. That just about covers it. If you’re ready to get started with real estate investing or even if you’ve been at it for a while now, I encourage you to read this one. It’s written in a very practical, down-to-earth style with tips about how to select a location for your investments, how to determine if a property is a good deal, how to manage your cash flow, etc. I’ve read a bunch of real estate investing books, and this one is one of my absolute favorites! Happy investing in 2013 – wishing you much success out there – make this your best year so far! Are you bold enough to make 2013 your best year ever? Knock, knock – 2013 is just around the corner! Are you okay with the status quo for your life, or are you interested in amp-ing it up to the next level? I return to this resource from Darren Hardy over at Success magazine year after year. SETTING goals is a great exercise, but all of us need a SYSTEM for holding ourselves accountable for results over time. Accountability is where the POWER comes full-force. What are YOUR most crucial goals for 2013 (physical, business, relational, and spiritual)? Go for it! Make 2013 your BEST year EVER! So, here’s another post continuing the story of how my life’s been overhauled over the past couple of years. 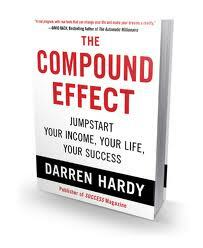 After I subscribed to Success magazine in 2010, I was introduced to a (then brand new) book called The Compound Effect by Darren Hardy – he’s the publisher of Success magazine. The primary premise of this very straight-forward, practical book is: each of us has the power to design our future, and our ongoing choices will ultimately have profound effects upon where we end up in life. In other words, our ultimate success (or, heaven forbid, failure) is our personal responsibility. The simple, practical concepts Darren presented in the material really took root and began to overhaul my thinking about what was possible in life. So – to sum-up, YOU are largely in control of your future success or failure, and the seemingly unimportant, insignificant choices that each of us make on a minute-by-minute, hourly, and daily basis have significant, far-reaching implications for our future. I’d love to hear your thoughts about this. Thank you for reading, and go make today an awesome day!